Today was a pretty beautiful day for January, The sun was out, I had sunglasses on, the air was mild and dry and the wind was pleasant from the East/EastNorthEast. I met up with Paula at the beach and just breathed out all the hussle of the week. I got a few great shot as we paddled out of the bay toward Cadboro point (and accidentally ran up a covered rock - whoooops ). The current was fairly light in Baynes channel, but was increasing near the point. I managed to find a nice, stable eddy near the rocks at the point and rode it for a couple minutes as we turned around for Jemmy Jones Island. 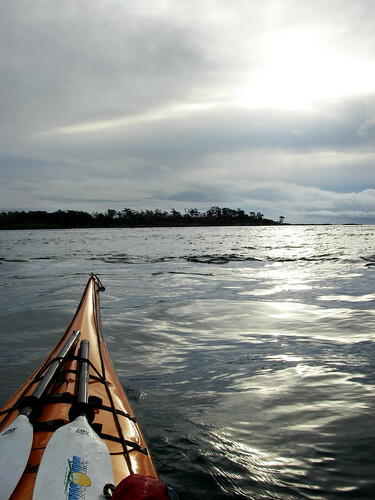 Today felt absolutely exotic for January and paula and I both paddled quietly to the island. There were some pretty gnarly kelp beds off the west corner of Jemmy and I just drifted along in the really light current. 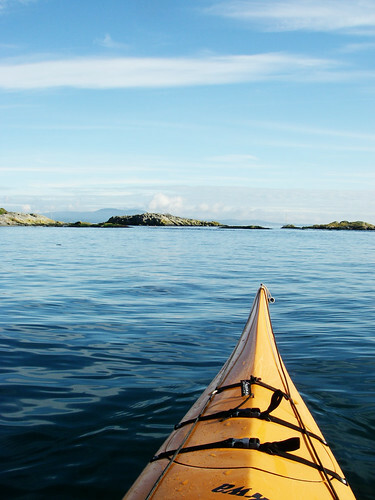 Paula was finished paddling for the day, so we split up here and I continued into oak bay. Fiddle reef was without its resident eagles today, and a very light current was flowing around the installation. 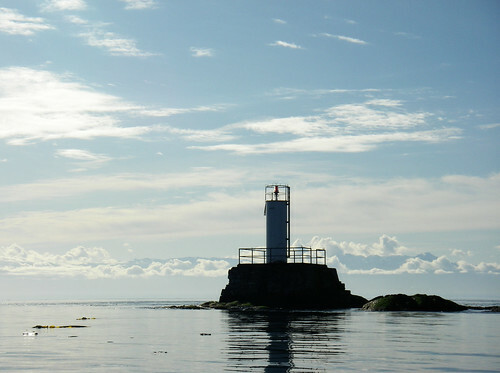 I got a nice little push around the light and toward Mary Tod Island. There were a couple of seals milling about in the gap between Emily Islet and Mary Tod. Still stinks like seal crap out there. Off in the distance you could here the unholy choir of gulls on Great Chain Island. 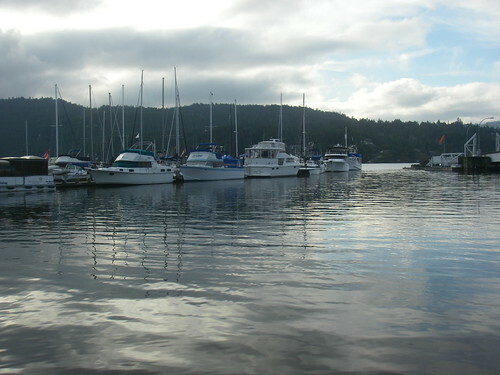 On the return trip, the sailboats were starting to leave the marinas. The wind had freshened a little and the conditions were great for a number of single handers. 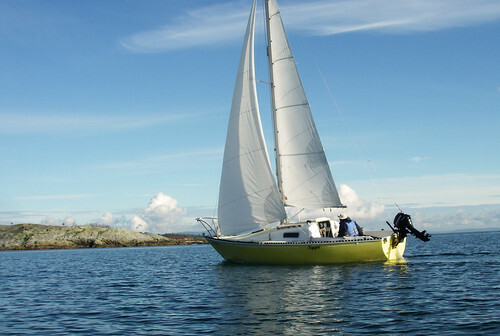 I crossed paths with sailing photographer, Andrew Madden, out in his boat, Tigger, a yellow hulled sailboat the ofter frequents Oak Bay. We had a chat as he attempted to beat out of the bay. The closer we got to Cattle Point, themore and more driftwood there was floating around. Some recent storms and high tide had brought a whole new crop of driftwood to the southeast side of the Vancouver Island. 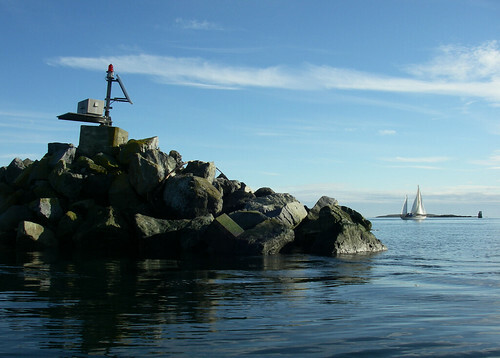 The trip back in was nice and smooth, I weaved my way down through the rocks and then cruised around the RVYC marina with just enough water to spare to get underneath the walkways. I saw Bernie out for a walk on the beach near the far end of the bay, near a beached sailboat. Lots and lots of driftwood around the boat too. Bernie reminded me that Paula had left her cart in my Van - oops again. You can read Paula's unhappy review of me on kayakyak if you'd like. I headed back to the beach and had a great sandwich in the sunshine at Olive Olio's. It's been a while since I've visted Brentwood bay, so today I got out to the launch beside the ferry and was greeted with very pleasant and calm touring conditions. 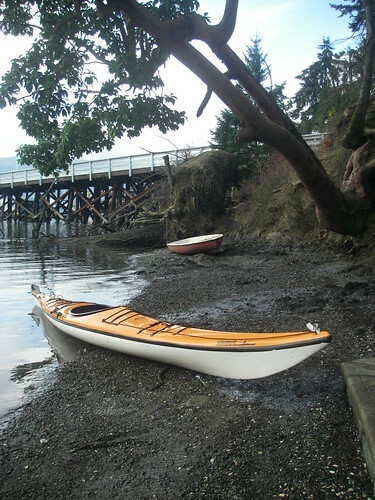 I took the kayak down the steep hill to the launch and found the beach nearly completely submerged at high tide. There was another group coming down the hill to put in, so I rushed a bit and pushed off.. I looked down and something was missing. The camera was not in my lifejacket. I returned to the beach and ran up to the van: no camera anywhere. Thinking I left it at home, I walked back down to the beach and put in again. 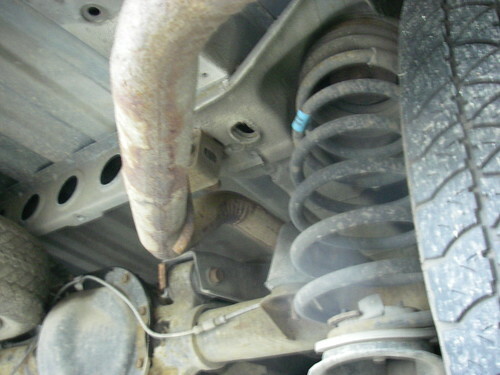 So in the true Canadian literature fashion, this blog post will be told from the camera's point of view as it sat under the rear differential of the cube van beside my van. Okay, no I won't. First, I went out to arguably the most beautiful place in the entire freaking world, Tod inlet. I can't even begin to describe this area it's a mix of old and forgotten manmade stuff and nature in the process of reclaiming it. What used to be a giant concrete quarry/factory is now just a ragged brick smokestack and disintegrating pier. The water was noiseless and one person walking the shore quieter than the gushing waterfall at the eastern end of the inlet. Despite the beauty, Tod inlet wasn't a very long paddle, so I decided to head out to 15 Minute (Seananus) Island which couldn't be more than 15 minutes away from the reach of Gowland/Tod park. It was a nice challenging paddle against a small headwind and current. 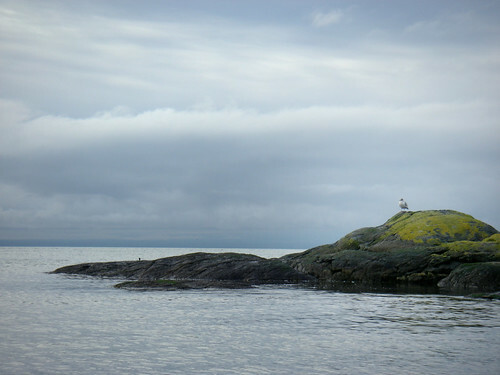 The Island was where all the birds live for the winter, with large swaths of birds taking flight as I approached. 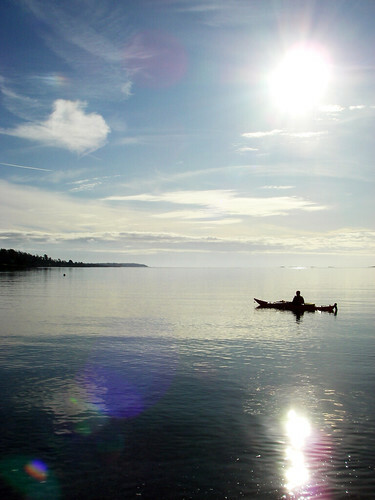 I headed directly across to the Saanich Peninsula and had a quiet and enjoyable paddle back to shore as the sun came out. Lots of wood had blown into the bay during the recent wind storms and I caught a few seagulls using the floating wood for uneasy perches until a boat came by and ruined it all. As I went to put the gear back in the van, I caught a glimpse of my camera, luckily still intact! I picked it up and ran back down to the kayak to get a couple parting photos. Sorry there aren't more photos this week and it pains me. Today I had planned to go to Brentwood Bay, but got distracted by a mirror flat Elk Lake on the highway out. 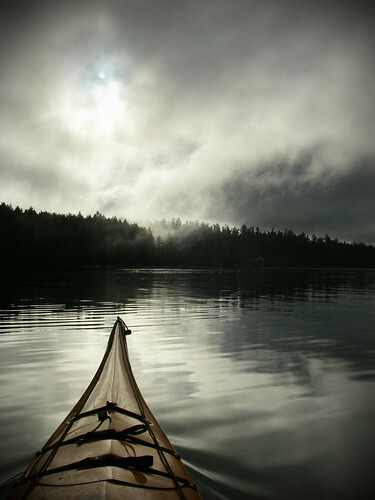 Since all of my normal paddling buddies are without vehicles right now, I have a feeling it'll be a bunch of solo paddles for the first part of 2010. I pulled up to an absolutely empty beach with only the hardiest of trail joggers and their pets walking by. The water however was full of rowers and fishermen. It was a cloudy and mild day with little wind. The water was clean and quite cold along the shore, and the distant shore had a large fog bank hovering over it. 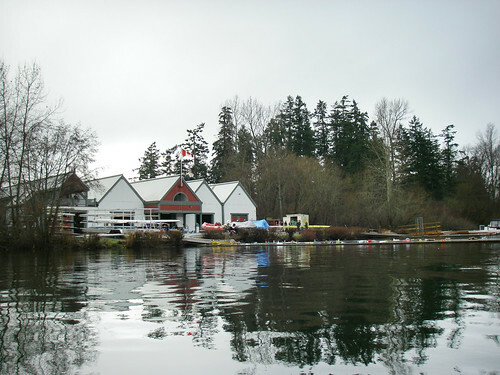 The rowing teams and the few independent rowers were busy doing laps of beaver and elk lake at a good clip. I stayed mostly along the shoreline to stay out of everyone's way. I fished a bit of plastic garbage off of the shoreline on my way to the rowing center. The docks were lines with colorful water bottles and shoes and there weren't too many people on land. I kept on going around the corner into beaver lake. So about the birds.. man there were a lot of birds out. 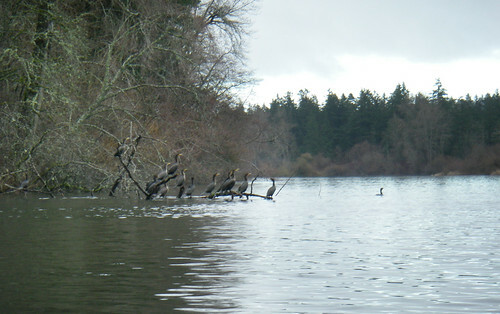 Eagles, ducks, herons cormorants, kingfishers and all kinds of songbirds. It felt like every few minutes I was accidentally startling the birds into flight. 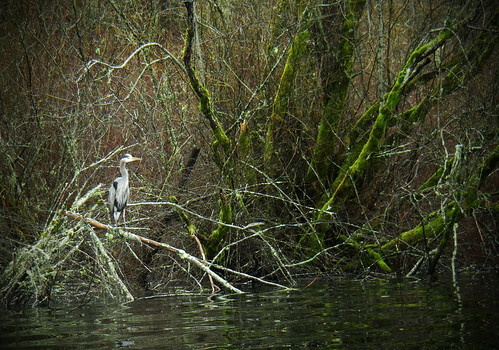 I got a photo of a Heron on the shore and he immediately took flight with a loud croaking noise.. scared the crap out of me. He flew around for about 30 seconds and then decided to land on top of a kingfisher's head. The kingfisher got the hell out of there and landed on a tree so close to me I thought I could reach up and pet it. He was a lot more intent on finding food and a place where I wasn't though. The weather was on the change all day today.. large rolling fog banks would get low down to the trees and thin out long enough for the sun to shine through. As I left Beaver lake, the rain began to fall. At first it was just spitting rain and moments later a full on torrent was upon the lake. Glad I brought my waterproof gear today. The downpour lasted nearly half of the trip and by the time I returned to the beach, everything had cleared up. They had closed the change room for the winter. Oh well.. I did my best to get changed discreetly. 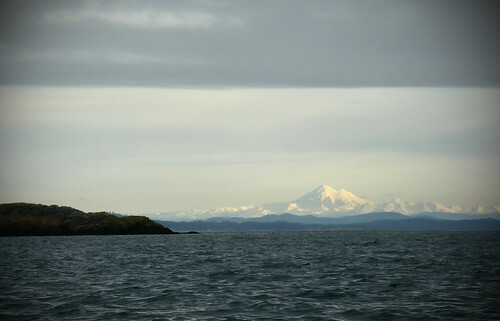 A really neat day on the water overall and a good place to get some paddling in with uncertain weather conditions. Already 3 days into the new year and I'm putting in at good old Cadboro Bay again. Looking back over last year, only a few of my 2009 goals were actually met due to a bunch of other circumstances. 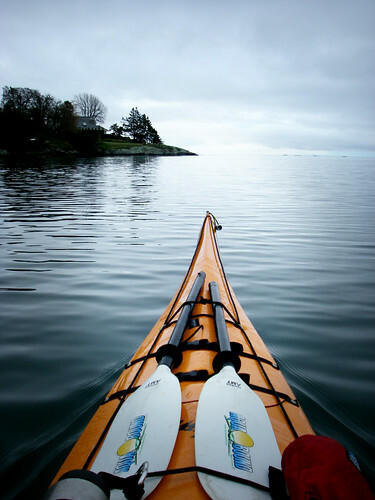 Most notably, attempting to kayak 1000km. Got lots of kayak camping done last year, but it's time for adventures in some new waters over this year. Today gave fairly light east winds and a manageable ebb current through Baynes channel, so Chatham was the goal. Grey is the color today as the water melts into a similar colored ceiling. The ferocity of the storms this winter has been way lower than last year. I had a hard time even thinking about hitting the water last December. The tide was moderately high and on its way out when I put my boat on the beach. I settled in for a short but fun trip up the east side of the bay, watching all the yacht club boats heading out to race. Lots of teeny tiny brown ducks on the water this year. The sun peeked out as I headed out into the first of a series of eddies in Baynes Channel. The current was moving quite swiftly at the 3/4 mark and gave me a bit of a wild ride into some of the standing waves. I ferried out of the waves and ended up at the western tip of the chatham islands and did a counterclockwise path around the islands. What a great treadmill that was! On my way around the north part of the island the wind began to pick up quite a bit, going from 2-3 knots to about 10 in just a few minutes. The winds were forecasted to get a little stonger in the afternoon anyway, so I was going to return a little further into the channel than I expected - not quite as much fun rides on the current as I wanted, but there was plenty of fun in between Strongtide and Vantreight Island with currents around 3 knots in the squeeze, sounded like being in a waterfall. The current was still fairly strong near chatham, but abated closer to Jemmy Jones and the wind had shifted Northeast making for another fun treadmill back home. 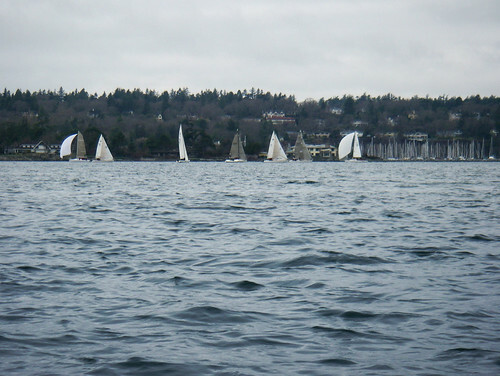 All the boats I'd seen scrambling out in the morning were coming back to the bay to round the windward mark in their race. Good spectacle watching the high tech boats expertly rounding the mark, while the others would end up wrapping their spinnakers with the fresh NE puffs just minutes later. I pulled back ashore on Cadboro bay and had a look at my GPS... it said I managed to hit a max speed of 14.5km/h in Baynes. Average speeds got up to about 11.3km/h - that was a nice surprise!